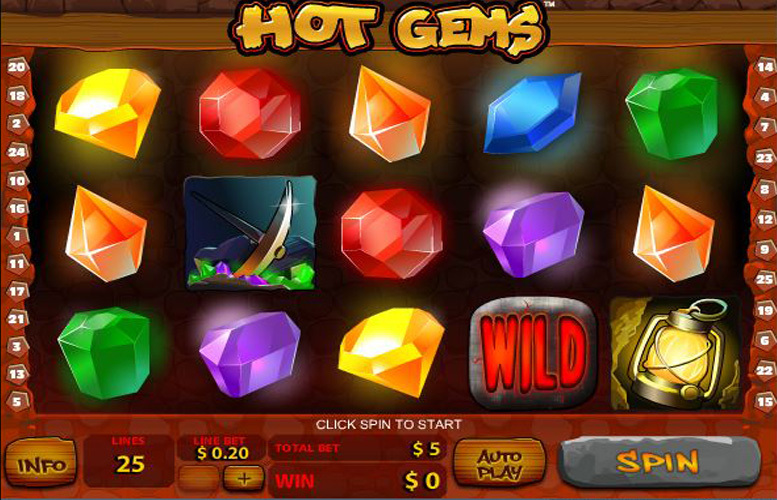 The Hot Gems slot from Playtech is a great looking machine that takes players to the heart of a gemstone mine to dig for treasure. It’s all precious stones, pick axes, and prospectors in this one. Unlike with real-world mining operations, the word “collapse” needn’t strike fear into players’ hearts though. The innovative “collapsing reels multiplier” makes striking it rich much easier than tunnelling into the earth in search of riches for yourself. Stylish looking machine which is very straight forward to play. The art design is nice, bright, and engaging. The somewhat unique take on free spin bonuses can make for substantial wins. Kind of basic gameplay. The single bonus round means that the game itself isn’t the most varied slot out there. Whilst the inclusion of collapsing winning symbols negates the impact this has on the players’ RTPs, those who enjoy multiple different ways to win big may feel that the game is limited. The fixed 25 win lines doesn’t allow players quite as much control over their stake as many other slot machines. Experienced players won’t mind this too much as they’ll be aware that the maximum RTP is realised when lines are set to maximum. Prospector = 5,000x the coin value. Lamp = 400x the coin value. Pickaxe = 300x the coin value. Mine Cart = 200x the coin value. Despite its lack of variety when it comes to bonus rounds, there are a few interesting ways in which the Hot Gems slot keeps things exciting for players. 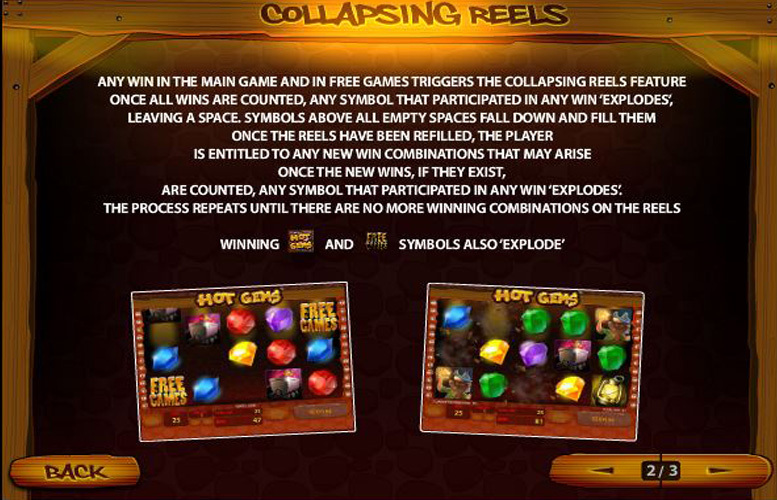 Every time you’re lucky enough to spin a winner on Hot Gems, the winning symbols collapse, allowing whatever is above them to fall into their place. This can turn a small win of less than your initial stake into an absolute whopper. What’s more, the process can repeat indefinitely, if you’re lucky enough. 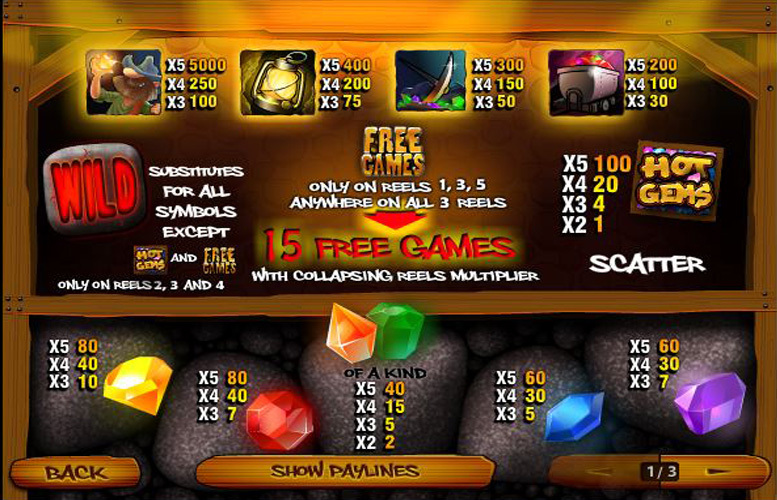 As with most slot machines these days, there’s a free spin bonus round on Hot Gems. To activate it, players must land the “Free Games” symbol on reels one, three, and five simultaneously. 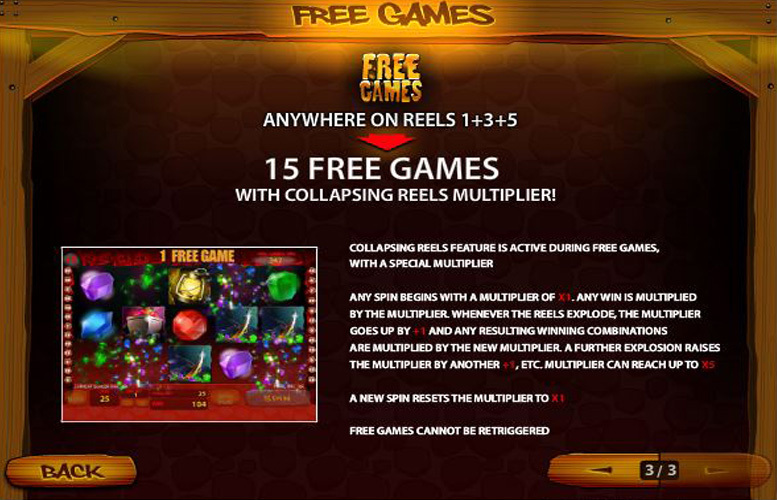 They are then awarded with 15 free spins, with a 1x multiplier. Not great, considering this is the only bonus round on the game, but wait, there is more. Like in the main game, each time you manage to hit a winning combination on a line, the symbols involved will collapse, and the machine replaces them with the symbol above. This time, however, the multiplier increases too. This means that if you’re lucky enough to win after the first collapse, you’ll be paid out with a x2 multiplier. This dynamic continues up to a sizeable x5 multiplier. A successful win at this point unfortunately returns the counter to x1, and players cannot win additional free spins during the round. Yellow and Red gems = 80x the line bet. Blue and Purple gems = 60x the line bet. Orange and Green gems = 40x the line bet. Unlike many other slots, there are less variables for players to use to mix up their betting size in Hot Gems. There are only three options to adjust the bet per line, and the number of lines is fixed at 25. There’s also no option to adjust the value of each coin played. Having such few options limits bet sizes to £5, £25, and £125. Playtech have undoubtedly designed a strong machine in Hot Gems. It certainly won’t be to everyone’s tastes however. The lack of multiple bonus rounds limits gameplay, and having few options to vary stakes will also not suit some. The unique take on bonus rounds feels like players must get very lucky to achieve any truly massive wins, but when they do, such wins will likely negate any potential dry spells players experience through standard variance. This game has a rating of 3 / 5 with 255 total reviews by the users.